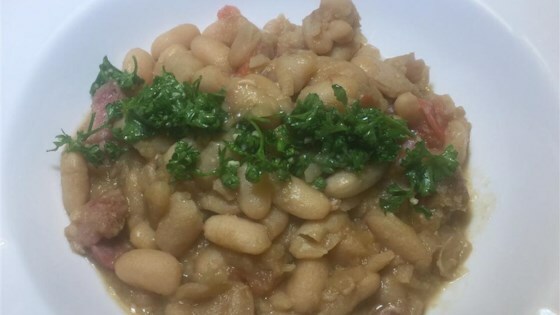 "Beautiful smoked pork shank delicious with white beans." Place cannellini beans in a large container and cover with several inches of cool water; let stand 8 hours to overnight. Drain and rinse. Melt butter in a heavy pot over medium heat. Cook and stir onion in hot butter until translucent, about 5 minutes. Add garlic; cook and stir until fragrant, about 1 minute. Stir pork shank, water, chicken stock, and bay leaves into onion mixture; bring to simmer, reduce heat to low, cover the pot with a lid, and simmer until flavors blend, about 45 minutes. Turn shank over and stir oregano, rosemary, and red pepper flakes into chicken stock mixture; add beans and stir. Return mixture to a simmer, cover the pot with a lid, and simmer until beans are almost tender, about 1 hour. Simmer uncovered until beans are tender, about 30 minutes more. Cool to room temperature, cover the pot, and refrigerate, 8 hours to overnight. Spoon accumulated fat from the top of the chilled bean mixture and discard fat. Remove pork shank; cut meat into slices and discard bone. Stir sliced pork shank, tomato, gremolata, salt, and black pepper into bean mixture over medium heat; cook and stir until heated through, 10 to 15 minutes. Comforting, rustic pork shank is braised with creamy white beans. Make the gremolata by using this recipe for Chef John's Gremolata. Very hearty recipe. Great techniques to learn in this recipe. I went the extra mile and made the gremolata and wasn't sorry. I didn't have fresh herbs so used dried and it was perfect. Put half the meat in the dish and then used the other half for potato soup. Yummy recipe!